Shen Zhou, the quintessential Ming scholar-amateur painter, preferred to live in retirement rather than risk the vicissitudes of government service. He devoted much of his later life to an exploration of the brush style of the fourteenth-century recluse-painter Wu Zhen (吳鎮, 1280–1354). Shen’s painting epitomizes the scholar-amateur tradition of self-expression; by depicting the interior world of the mind and heart, it embodies the essence of Chinese artistic striving. The painting’s imagery is about private places: secluded dwellings hidden in the heart of the landscape. Shen’s calligraphic brushwork, like handwriting, subtly conveys the writer’s mind and personality. 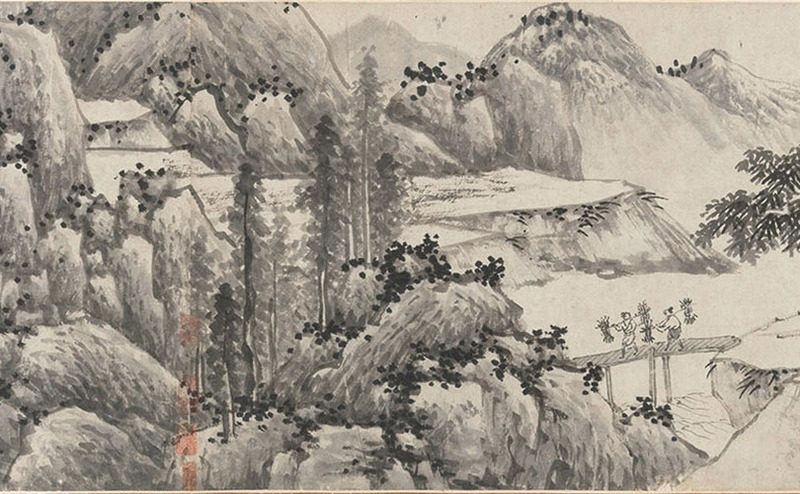 Shen’s most ambitious landscape composition—the scroll is over fifty-six feet (seventeen meters) long—it shows the artist systematically reinterpreting Wu Zhen’s brush idiom while striving for a new compositional monumentality.